KANSAS CITY, Kan. — Lent starts next week. Which means some of us folks in the pews need to start scrambling if we’re to be ready to launch on Ash Wednesday. But laypeople aren’t the only ones who commit to improving their relationship with God during this penitential season. 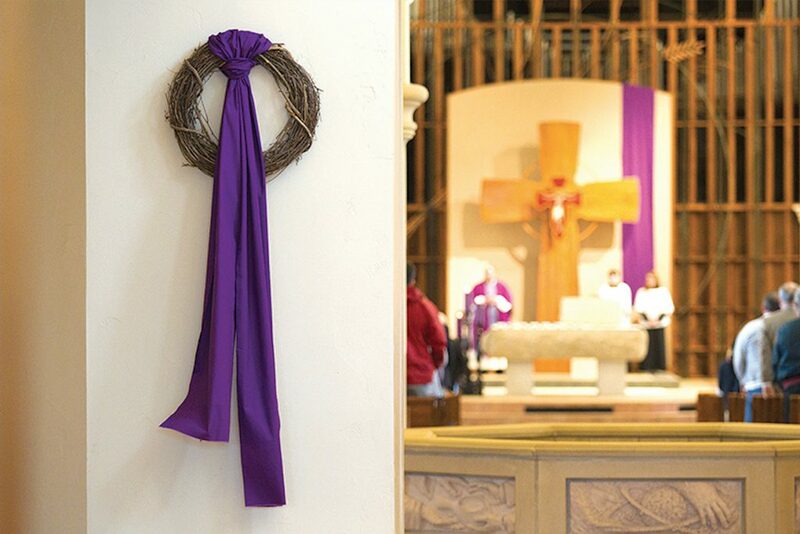 Spiritual growth, said Father Tim Haberkorn, pastor of Sacred Heart-St. Joseph Parish in Topeka, is the ultimate goal for him personally during Lent, as well as something he wants to encourage in the parishioners he serves daily. Father Haberkorn said it might sound easy, but in practice it can be tough. Another area, Father Haberkorn said, with which he struggles and knows others do, too, is practicing patience. “I think if there would be a fourth virtue, it would be patience, because everyone needs a bit more patience with one another and ourselves. No matter how one chooses to prepare for Easter, Father Haberkorn said it’s important to remember the point of Lent. Reflecting on his 25 years as a priest, Father Haberkorn said celebrating the season has changed for him. He remembers how the Lent before his 25th anniversary as a priest was particularly meaningful for him. “That Lent was a time for recommitment, recharging, reviewing, but also kind of like a battery charge for future ministry and what lies ahead. “Starting out in priesthood, I was concerned about getting it right in terms of the rubrics and getting it right in terms of practice. “Now, it’s on a deeper level. It’s about how you’re going to be, and that’s why I think there’s a difference now in terms of doing versus being. Father Haberkorn also said that Lenten sacrifices, while beneficial, need to lead Catholics to a deeper faith. “All those things (giving up chocolate or dessert, praying the Stations of the Cross, etc.) are good things, but unless it changes your being, I think it’s only temporary and fleeting. It’s just a seasonal thing. Father Michael Peterson says that when he thinks of Lent, he thinks first about the needs of his parishes — all four of them! Father Peterson is pastor of St. Bernard in Wamego, St. Joseph in Flush, Holy Family in Alma and Sacred Heart in Paxico. During Lent, Father Peterson leads the Stations of the Cross for his parishioners, something in which he finds solace. Also, on most Fridays, parishioners are likely to find him at one of the fish fry dinners that provide him more opportunities to simply connect with them. Spending time at each parish, Father Peterson said, is something he strives to do throughout the year, but Lent provides more opportunities. Being the pastor of four parishes is a challenge — especially logistically. So, it is no surprise that his personal Lenten goals are at least partially practical. During seminary, he said, the environment was highly structured and afforded him many opportunities to reflect on his spiritual growth during the Lenten season. Making a permanent change in one’s life, said Father Nick Blaha, pastor of St. Catherine Parish in Emporia and chaplain/director of the Didde Catholic Campus Center at Emporia State University, is the ultimate goal of Lent. Every year, the eight-year veteran of the priesthood reviews the physical, spiritual, intellectual and technological aspects of his life. After prayer and discernment, he commits to specific resolutions in each area. Father Blaha said those Lents for which he has seen much growth have been the ones in which he consistently practiced and constantly kept in mind his Lenten goals. Still, he said, it’s easy to overlook the point of making a Lenten sacrifice or committing to some pious act during Lent. The point of anything done in Lent, he emphasized, is to change and grow closer in friendship with Jesus. Like Father Blaha, Father Nathan Haverland, pastor of St. Gregory Parish in Marysville and St. Malachy in Beattie, said he has found the best Lents to be ones of sacrifice. “I think the best Lents have been those where the Lenten resolutions were the hardest. One year, he gave up music for Lent. He was driving a lot that year, so it was a real sacrifice. Perhaps though, an even more memorable Lent was the year he tried something even more extreme. “One year, I gave up my bed for Lent. It was during the seminary. It was quite a sacrifice. Usually, I try to pick things that people don’t see or notice because I don’t do it to get noticed. It was a fulfilling Lenten mortification — and he was very happy to get back his bed at Easter. “I think you realize, in doing things like that, how fruitful sacrifice is. We usually think of sacrifice as suffering, but there can be a lot of fruit that comes from sacrifice. “Just giving up a little bit of comfort reminds you of those that have no comfort at all. Thank you for being so graciously kind baptizing my two infant son’s 26 years ago without all the red tape. Your love for baptism has encouraged me to pay it forward and help other families through baptism. With the Holy Spirit and your kind patient act we thank you Father. God bless.